Musings of a Palaeolinguist: The Final Fall of the Pre-Clovis Barrier? Back when I was an undegrad and I was learning about New World archaeology, I became fascinated with the topic of the peopleing of Americas. I loved how it involved not only archaeological data, but linguistic and genetic as well. SFU's own Knut Fladmark had popularised a theory which I found more plausible than the common idea of the first peoples entering North America through Beringia and down through an 'ice-free corridor' down near the British Columbia-Alberta border into the States, between the Cordilleran and Laurentide ice sheets. Fladmark proposed that first peoples could have came through a coastal migration along the coast, island hopping and living in refugia - areas not covered by mountains of ice, such as Haida Gwaii. Haida Gwaii (previously known as the Queen Charlotte Islands) have a unique ecology because they have a few thousand years less time spent under the ice than the rest of Canada. Apparently I've been there when I was very yound, to Sandspit, but I have no memory and would love to visit what I imagine to be Vancouver Island but a bit more rugged and desolate. Perhaps I like the coastal migration theory a bit because as a west coast Canadian girl, it puts my homeland right in the way of the first migrations, but it also sounds more plausable for a number of other reasons. One is that the ice free corridor might not have been open at the time - and if it was, the harsh environment between the glaciers would offer a puzzling mystery of why people ventured down between into a stormy place with no fish in the rivers and high mountains of ice on either side. Where did they think they were heading? Another reason I find the ice free corridor idea imnplausable is the archaeological and linguistic evidence do not support it. The oldest accepted site (until now) in the New World has been Monte Verde, a 12,500 year old site at the bottom tip of South America - nothing near that old has been found on Beringia or Alaska. An old undergraduate essay I wrote, back when I was even worse at academic essays, wrote about this coastal migration hypothesis and the evidence supporting it. The linguistic evidence was one of the most interesting supporting factors. The longer people have been in one place, the more languages and language isolates you usually find. If one follows the ice-free corridor hypothesis, you would expect to find the most linguistic diversity in the central area of America, but you find it along the west coast of North America. If a coastal people entered America with watercraft, it wouldn't be too suprising if their migration south was a bit quicker than overland - making the Monte Verde site less of a mystery. 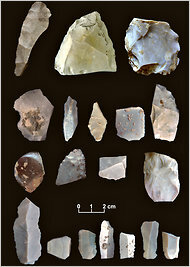 But now, a 15,500 year old site, quite a bit older than even Monte Verde, has been found in Texas. The reason this is so special, is that if people entered North America at this time, there was probably no open ice free corridor at the time. There has been a well known resistance to sites with suggested dates that put them at a pre-Clovis date, such as Meadowcroft and Pedra Furada. If this new site is accepted by the archaeological community though, perhaps the coastal migration hypothesis will be lent new support. Growing up on the Oregon coast, there is no question in my mind. We were always picking up stuff from Japan. Lots of historical records of survivors from Asian shipwrecks drifting over here too. Just prior to Lewis and Clark's expedtion there was a little mini-kingdom up by Neakahnie I think, headed by what sounds like a Japanese guy. That lg diversity thing is a good catch. It's also a glitch in Atkinson's data.